The beautiful 18-hole championship Duke University Golf Course opened in 1957 and is the only Robert Trent Jones-designed course in the region. Redesigned by Jones’ son, Rees, in 1994, the Course is considered one of the top ten golf courses in North Carolina. Site of the 2001 NCAA Men's Golf Championship, our Course consistently receives top rankings from Golf Digest, Golf Week, Golf Magazine and the Zagat Survey. Six PGA Professionals and one Master PGA Professional are on staff and available for group or private lessons. The Triangle Business Journal recently voted the Duke University Golf Course as the best public course in the Triangle. Duke University, already home to the best basketball team in the Triangle, can now boast of having the best public golf course as well. From March 24 through March 30, visitors to www.trianglebusinessjournal.com and recipients of TBJ's Daily E-mail Update were asked: Which of these public courses do you rate as the best overall golf venue in the Triangle? 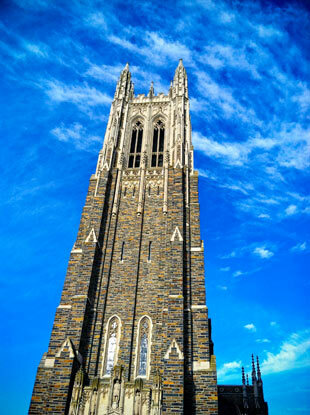 Of the 1,668 votes cast in the unscientific survey, 37 percent rated the Duke University Golf Course the best. Golfers rave about our state-of-art practice area that boasts driving range, six putting and chipping greens, seven sand bunkers, and eight target greens. All of this is surrounded by a grove of tall pines and stately hardwoods. Our Golf Shop has been recognized by the PGA as one of the best shops in the Carolinas and includes breathtaking views of the Course and easy access to lockers and the Inn’s Fitness Center.